We haven’t had much snow here this winter and I’m surprised to say that I’m a bit sad, but I’m sad for Lil so it’s not so surprising. 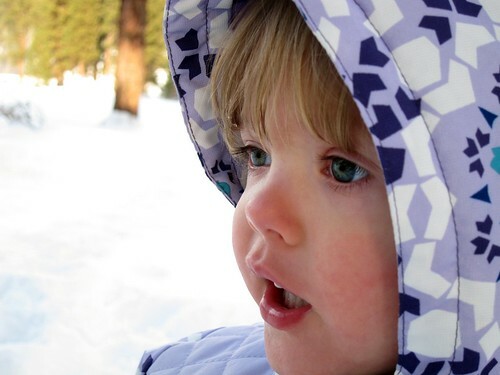 She had so much fun playing in the snow in Montana and she keeps asking me when we’re going to get to do it again that I just feel bad that we haven’t had a day or two more then we have had. So the last time she asked I told her that we’d drive up to the mountains and find her some snow. Waldo told her the same thing later that day or the next day so we figured we’d better really do this. Waldo’s brother gave us an idea of a good place to go that was about 45 minutes away. We got as ready as we were going to get and we were off. 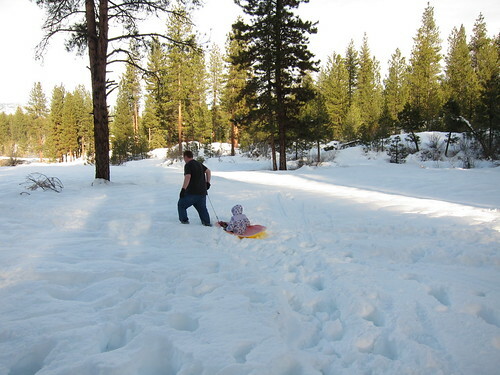 The drive was closer to 90 minutes, but we got to Idaho City and just past the tiny town they have a whole hill and play area for sledding. 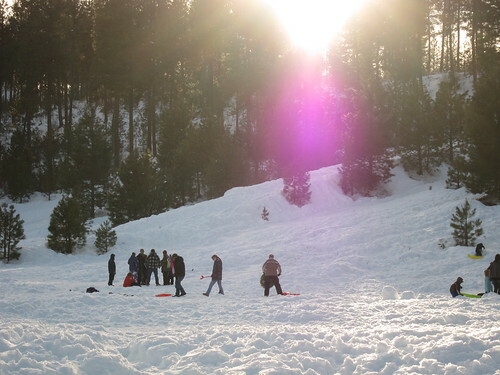 I guess the people of Idaho City take their sledding pretty seriously, all 450 of them. There were port-a-potties and dogs, lots of dogs. A few people had set up camp fires and had chairs set up around them. We thought that was pretty weird, but I guess they probably thought we were the weird ones. In our canvas shoes and jeans, Waldo and I anyway. Lily had jeans and rain boots on. We figured out really quickly that we are city people, small cities, but cities non the less. 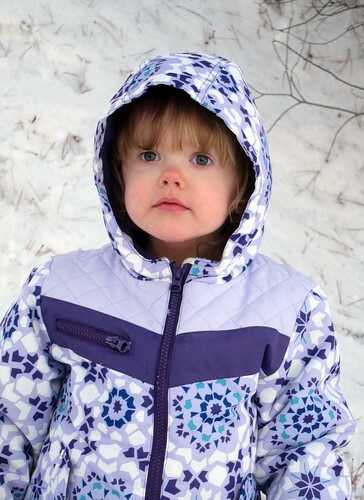 We are not made for hanging out in the snow. 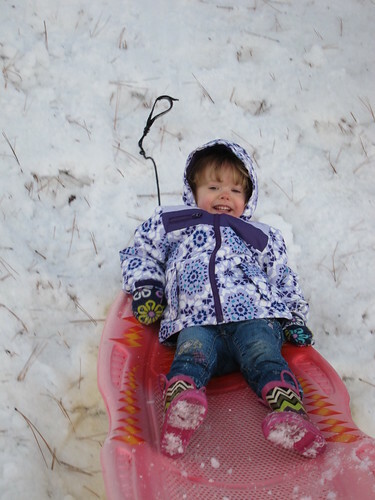 After finding a parking place and getting Lil’s jacket and all of our gloves on we surveyed the sledding area and decided on a area out past the majority of people because there was a very gradual hill there and we thought Lil would have more fun there. 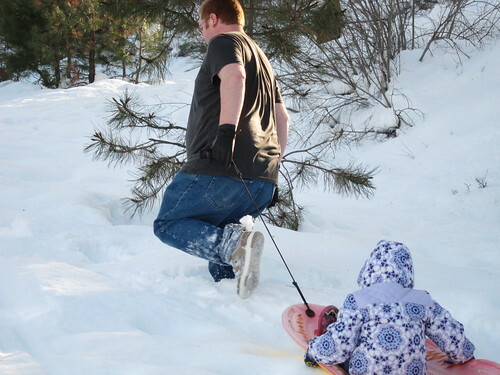 There was a reason that all of the seasoned sledders weren’t playing over there and we figured it out quickly. On our way to our chosen spot we wondered off of the trampled path for a bit and ended up in snow up to our knees. Once we worked our way the edge of the wonder-hill’s area it became so hard to walk, because just about every step your feet would break though the snow and you’d end up to your ankles if we were lucky, our knees if we were and then have to try to take another step. Even thought I know that snow had many different characteristics on any given day I always assume that it’s light and fluffy. 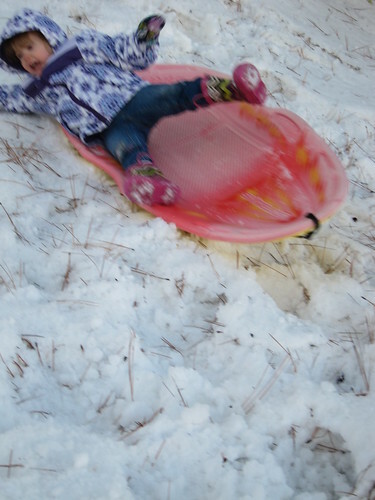 Not this snow, it was too frozen, hard, it had sharp edges and wouldn’t stick together for anything. 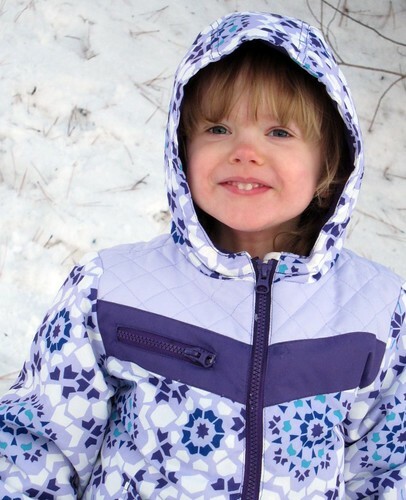 Lil really wanted to make a snow cat, but this snow would have none of that. 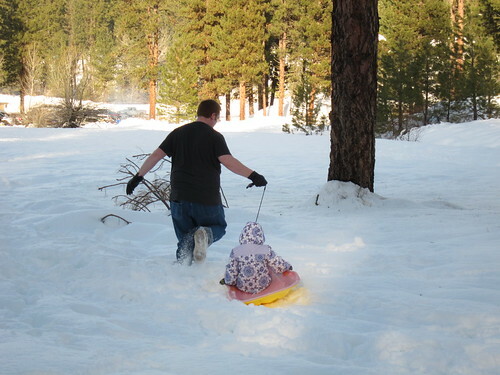 When we finally got to wonder-hill Waldo loaded Lil on the sled and took her up the little incline and let her go. They went up and down a dozen or so times and I took pictures. After a bit Waldo was tired of pulling his legs our of the snow and Lil was tried of being cold so we started the trek back to the car. At this point Waldo realizes his jacket is still hanging out on a tree and I’m closer (but not by much) so I turn around and go back for it. This was so miserable. Every time my foot would break thought the snow I felt little razors on my leg and my shoe was full of ice, it just wasn’t fun. After I got back to him and gave him his jacket I took a look at my leg and it was bleeding a little bit from the sharp edges of the snow. Let me repeat myself, the sharp edges of the SNOW. I would have taken a picture, but I didn’t shave so I wouldn’t have shown it to anyone anyway. 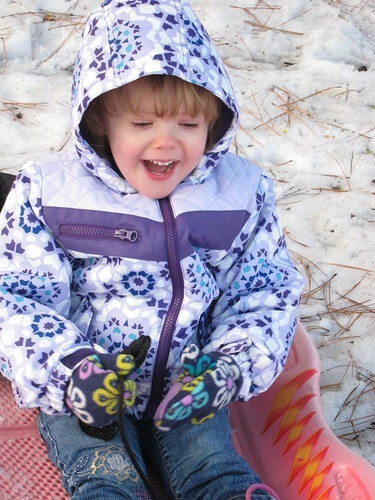 After trudging past the majority of sledders I offered Lil a little bit of free play in the snow before we left. 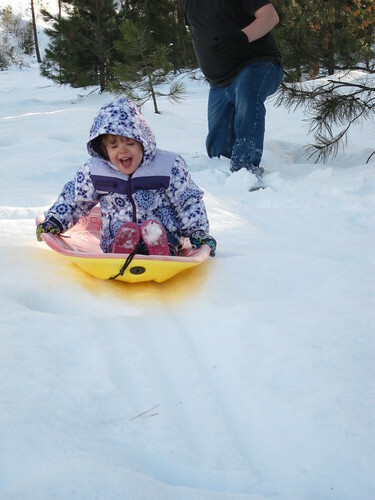 She didn’t want to do that, but while she was thinking about it Waldo and I decided to give sledding another try at a spot where the snow looked shallower. It was a lie, it was just as deep, but we could get there from the parking lot a lot easier. 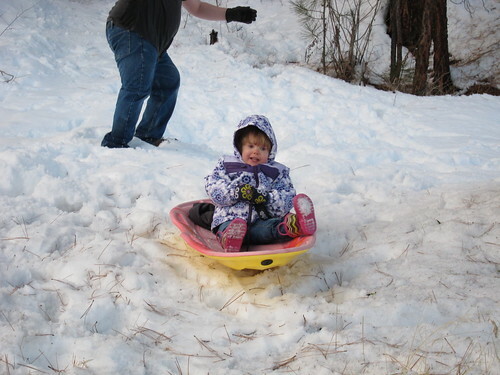 So we let Lil have some more sledding time. This was easily the best part of the day and made the whole thing worth our while. 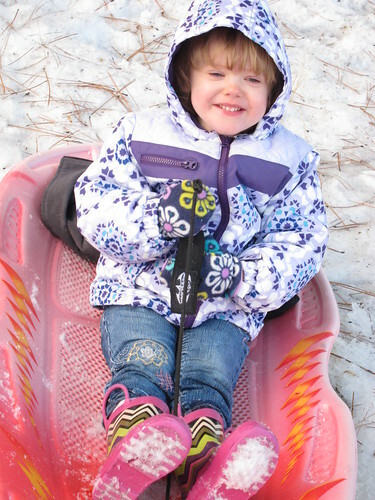 Lily had so much fun sledding and can’t wait to do it again. 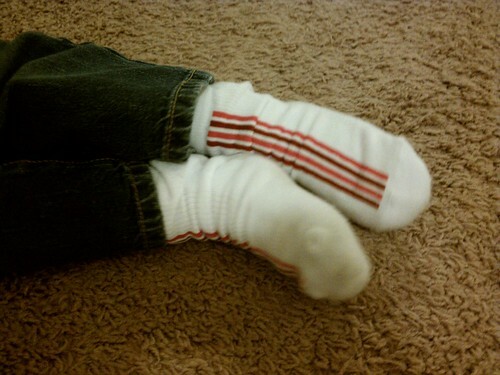 Just to prove what city folk we truly are, none of us had extra socks when we got back to the car. The diaper bag, thankfully had extra pants and underwear for Lil, but somehow even that held no socks. We had to drive to the tiny local grocery store (if you can really call it that) and buy socks. Of course they had no kiddo socks so I had to buy her women’s socks and we called them tights. She didn’t fall for it and hated them, but they warmed her feet so she left them on. When we got home she told me to take them back to the store and when I told her we couldn’t and I would just use them she told me to take a picture of them. So I did. 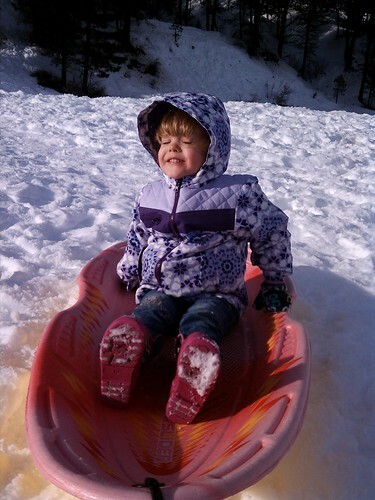 This entry was posted in Fun, Life, Lily, Us, Waldo and tagged Fun, Lil, Us, Waldo.